Sixteen-year-old Cara Lange has always been a loner, even more so since she moved away from her best and only friend, Zoe, a few years ago. Cara mostly spends her time avoiding the popular girls who call her 'choker' after a humiliating incident in the cafeteria, and watching Ethan Gray from a distance, wishing he would finally notice her. Then one day Cara comes home and finds Zoe waiting for her. Zoe's on the run from problems at home, and Cara agrees to help her hide. With Zoe back, Cara's life changes overnight. Zoe gives her a new look and new confidence, and before she can blink, Cara is flirting with Ethan and getting invited to parties. And best of all, she has her best friend to confide in again. But just as quickly as Cara's life came together, it starts to unravel. A girl goes missing in her town, and everyone is a suspect ~ including Ethan. Worse still, Zoe starts behaving very strangely, and Cara begins to wonder what exactly her friend does all day when she's at school. You're supposed to be able to trust your best friend no matter what, but what if she turns into a total stranger? 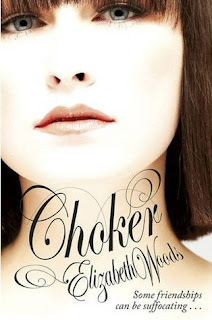 I enjoyed choker as a quick read and thought the ideas within it were really interesting. You start this book not knowing quite what type of story it is. It appears to be a story about a lonely girl and her transformation from "that odd girl" to "that cool girl" through the help of her best friend. However things aren't always what they seem. The story starts out as I said with a bit of a mean girls thing going on. Cara is miserable. Her parents barely acknowledge she exists. Her best friend moved away years ago and the popular girls at school torment her for an incident where she almost choked to death in the school cafeteria. All in all life is not good. Life for Cara seems like it is improved with the sudden reappearance of Zoe, Cara's old best friend, who helps her to get noticed by 'the boy' and get invited to the coolest parties. The only thing is at the same time as Cara getting popular accidents start to happen to the popular girls who treated her badly. As well as this Zoe's behaviour starts to become erratic and Cara starts to doubt the friend she once knew. I won't tell you what happens from there on out but be warned before you read this one. It is one of those books you'll want to read again a second time as soon as you finish reading it as things that happen put the whole book into a different light by the time you get to the end. An interesting and engaging debut which I enjoyed. I've been seeing this around a lot and it sounds really good. Thanks for your great review!